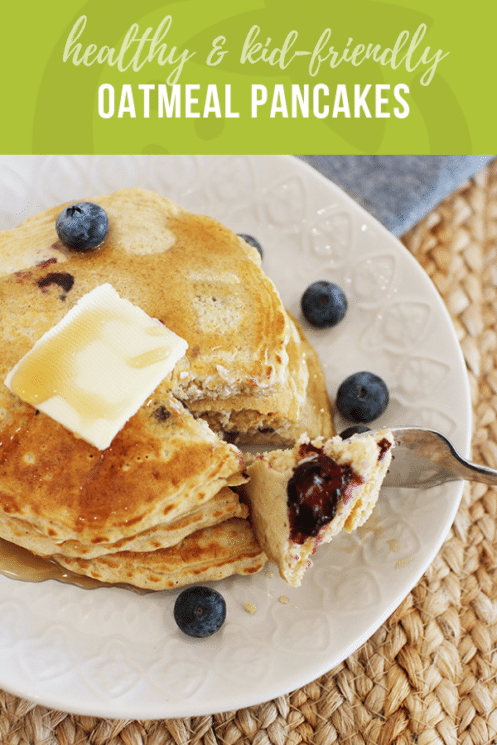 Add these healthy Oatmeal Pancakes to your list of quick, kid-approved whole grain breakfasts! Kids and pancakes. Pancakes and kids. Is there any sweeter match? These tender, fluffy oatmeal pancakes have all the kid-appeal in the world, and they’re filled with healthy, whole food ingredients we want our kids to be eating. So let’s dig in! Pancakes have a bad rap for being pure empty carbs, but these Oatmeal Pancakes break the mold by delivering great nutrition! They’re made from 100% whole grains, including fiber-rich whole wheat flour and rolled oats. Whole grains provide extra vitamins and minerals for your kiddos at breakfast, and they also keep your kids energy levels sustained over time. Top these pancakes with fresh fruit and you have an even more nutrient-dense breakfast! Mixing up the batter for these pancakes is just like mixing up any pancake batter… almost. You’ll need to pulse your rolled oats in a blender before you add them to the bowl, so the consistency of the oats matches the rest of your dry ingredients. Once your oats are ground, mix together the remaining dry ingredients, then fold in the wet ingredients, gently. A couple of lumps are OK… under-mixing just slightly actually helps keep your pancakes fluffy. 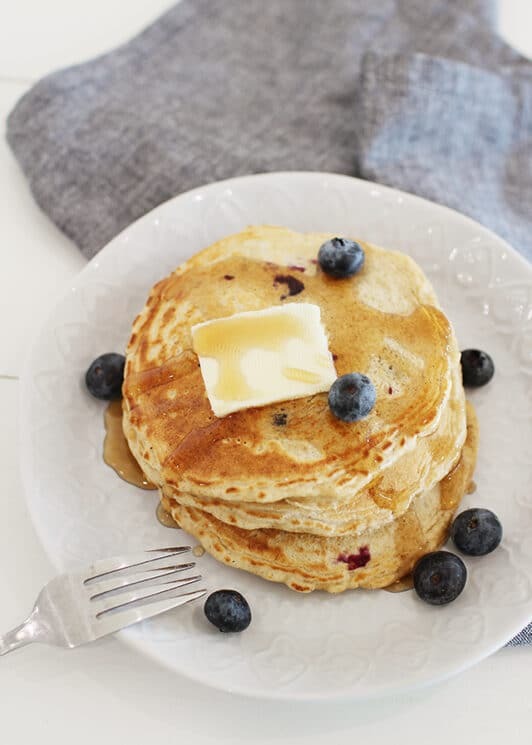 Ladle your batter into a buttered skillet ¼ cup at a time, and sprinkle each pancake with a few blueberries. When the pancakes start to look dry around the edges, give them a flip. One more minute on the skillet, and they’re ready for your hungry little ones. Got extra Oatmeal Pancakes? OK right, probably not. BUT if you do, throw them in sandwich bags and freeze them for a snack emergency on another day. They’ll heat back up in just a minute or two in the toaster oven. Looking for more pancake magic? Of course you are. Try Basic Pancakes 6 Ways, Brain Booster Pancakes, and making your own Homemade Pancake Mix! Place oats into blender and pulse into a flour. Pour into a mixing bowl and add flour, baking powder, salt, and cinnamon. Whisk together. Add milk, egg, maple syrup, melted coconut oil, and vanilla to a small mixing bowl and whisk together. Pour into flour and gently stir to combine. Spray a large skillet with cooking spray and heat over medium. Once hot, add pancake batter 1/4 cup at a time. 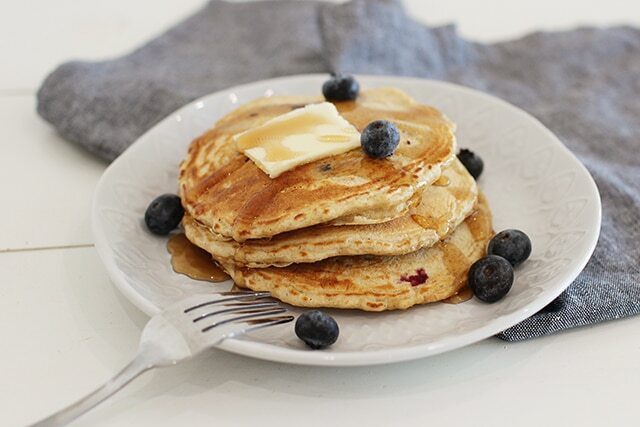 Scatter blueberries on top of pancake batter. Once bubbly, flip and continue to cook for 1-2 minutes longer. Continue until all batter has been used. Serve hot topped with butter and syrup if you like. Our family LOVES pancakes! I am all over this recipe! Thank you! We’ve been on a pancake kick. We LOVE them and would love to try Quaker’s new product! Thanks for the giveaway. Oh would love to try these! Pick me please! if they’ll ship to Canada, I’d love to win this! Oh, this sounds awesome!! My family loves pancakes, and the convenience of a mix can’t be beat. 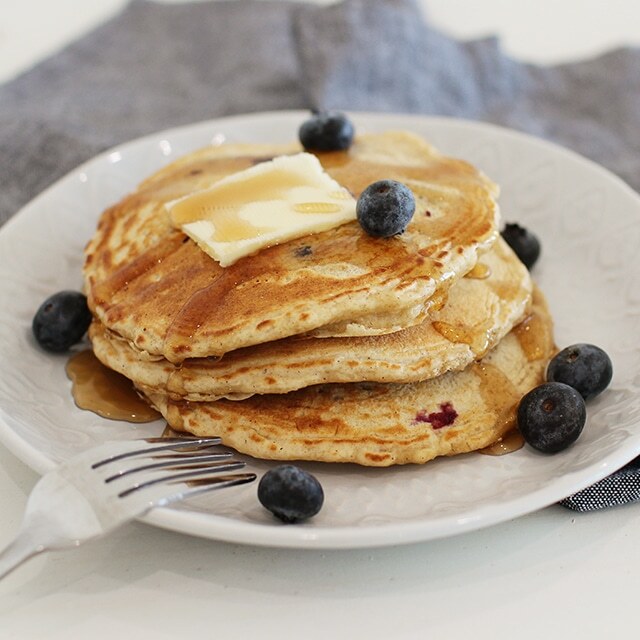 We pick local blueberries in the summertime, and stock the freezer, so they’re handy to throw into pancakes. Yum! Oatmeal in pancakes? I’m intrigued! I’m lucky enough to have a two year old who eats about everything, but my husband is the finicky eater. I’ll have to try these on him. 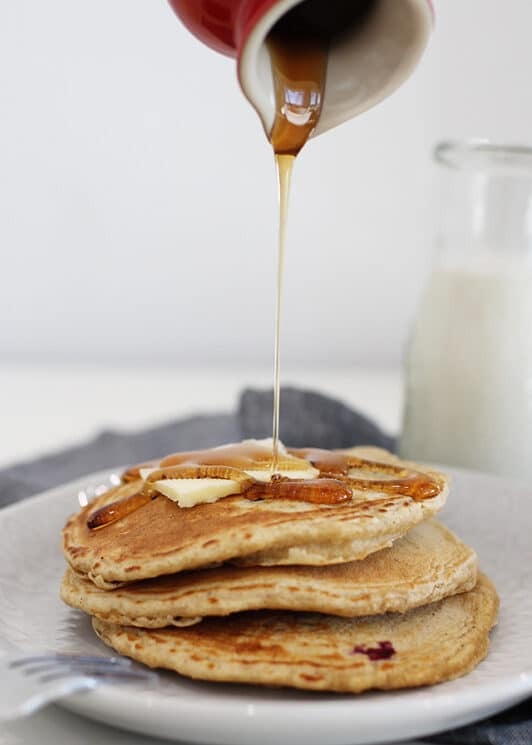 My husband makes pancakes every Saturday morning – we’d love to try these! I’d love to find a way to get some oatmeal in my kids!! Yum! We’d love to try these. We rotate pancakes and oatmeal every few days for hot breakfasts. I’d love to know on pancake days they were still getting the oats. My kids love having pancakes for breakfast and sometimes even dinner. I am excited Quaker came out with this, I love the thought of the extra nutrition in the pancakes. Amy- I made these for your kids when I babysat last weekend and they LOVED them and so did I. They were a little more dense than white pancakes, but that is one of my pet peeves about regular pancakes – they fall apart. These were really great and had a good flavor – I didn’t feel like the oatmeal flavor was overwhelming at all. What a great recipe. My recipe of the week is Chocolate Chip Banana Pancakes. I need to try it with oatmeal. Thanks for the tip! I have a pancake recipe that uses oatmeal, wheat germ, wheat flour, and bananas that my kids love. I will have to find it and share it with you, for those who may not win the giveaway. I like to have packaged stuff on hand for those days where making it from scratch just seem impossible. I’d like to try it. I love oatmeal and pancakes, so it sounds great! My little boy asked for pancakes for breakfast every morning for a week straight! Good thing I had some frozen right?! This mix would be great for some more yummy breakfasts. MMMM…. We love pancakes! My favorite ad in is Huckleberry’s! I hope I win!!! these sound yummy! we have a whole wheat pancake mix that we love, but since we all love oatmeal too, i think this would be a hit around here! Can’t wait to try this! This sounds like a great solution for my picky toddlers (and husband) who happen to love Pancakes! wow! quaker rocks with the giveaways!!! we love pancakes and would love the chance to try these! We love oatmeal and we love pancakes! I’m wondering if the oatmeal is flaked or if the mix uses oatmeal flour? Love oatmeal waffles, this mix could make a fast hot breakfast. I think I want Mary Kathryn’s recipe too, they sound delish! Saturday morning means pancakes at our house! I’d love to try these!! Oh, I hope I get picked! Things sound so yummy to try! The ingredients are oat flour, whole wheat flour, brown sugar, dried molasses, salt, soy lecithin, soy flour. Oh I HAVE to win this! My husband makes pancakes every Saturday and I’ve been trying to get him to make a healthier batter. I think he’d be totally game to try this one! What a fabulous find! I’ll have to try those out. If I don’t win, I’ll have to take a trip to the grocery store sometime soon. I have 2 little girls who love oatmeal — so that’s great — but I’ve really been looking for a variation. This gives them to oatmeal, which is a good way to start the day, with a twist. I’m lovin’ it! I love oatmeal so I am sure I would love this! Greg makes pancakes (or waffles, etc.) with the girls every Saturday. But, does not like to try other things besides his Bisquick. I bet he would love this – He loves oatmeal! Would love to try the new pancake mix! yum! we love pancakes! had them for dinner in fact! thanks! Oatmeal pancakes! What a great idea. Makes you wonder what the folks at Quaker will come up with next. Wow the pancakes sound great! I would love to win a box. Thanks for another great giveaway! We love oatmeal (it’s my 5 year old’s favorite food) but it would be fun to try something new. Thanks for the giveaway! I LOVE quaker oats and pancakes, I can’t wait to try this out! I would love to try this mix! Love the oats! We love pancakes in our house and have them at least once a week. We love oatmeal and pancakes. I look forward to trying them. I even just stocked up on 16 containers of the quaker regular oats. I would love to try oatmeal pancakes. Sometimes we just put oatmeal into our regular pancake batter. Dan adds oatmeal to anything!! Tasty! We just made blueberry pancakes the other day with fresh blueberries- they were really good. This would be great for my family of five. 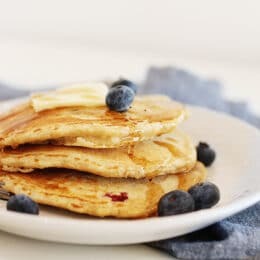 Pancakes are the one food that everyone eats and I am always looking for a way to make them healthier. I love Quaker and oatmeal! Great idea! I love the idea of using oats!! I want to make these for my just begundiet and plan to add a just a few raisins, sunflower seeds and pecans for pizazz! If I make a batch ahead and freeze them, I’ll have a healthy snack or breakfast on the go. They sound great and I love oatmeal but just don’t have time in the morning. I love oat meal. Currently my wife and I are really trying to get our 3year old son to try eating oatmeal but with a child this age we’re better off trying to get it to snow in Los Angeles but now that Quaker has put out this product maybe there’s hope being that our son loves pancakes! if we can also get a chance at trying it for free, that’s even more awesome than knowing it exist. Sounds awesome! Looking forward to trying it. I am looking for a healthy replacement to Aunt Jemima for my kids who are pancake lovers.